Average life expectancy can fool you into thinking you still have many years ahead. But what would it be like if you had only one left? What would you want to—what could you—experience in this limited period of time? 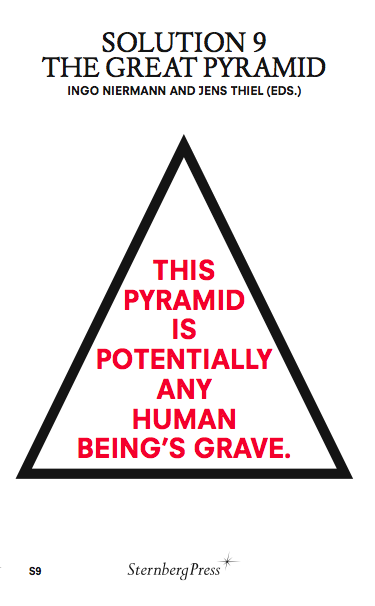 Artist Erik Niedling would like to be buried in Pyramid Mountain, the largest tomb of all time, conceived by writer Ingo Niermann. To make this goal a reality, Niedling lives one year as though it were his last. 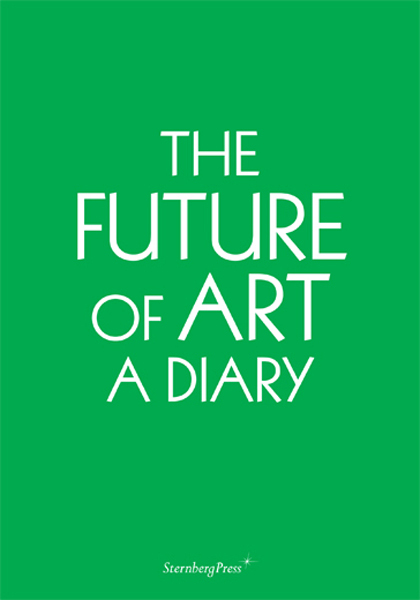 The Future of Art: A Diary recounts the joys and horrors of that year. A letter by Tom McCarthy examines the social and philosophical implications. In 1831 Honoré de Balzac wrote a short story, “The Unknown Masterpiece,” in which he invented the abstract painting. 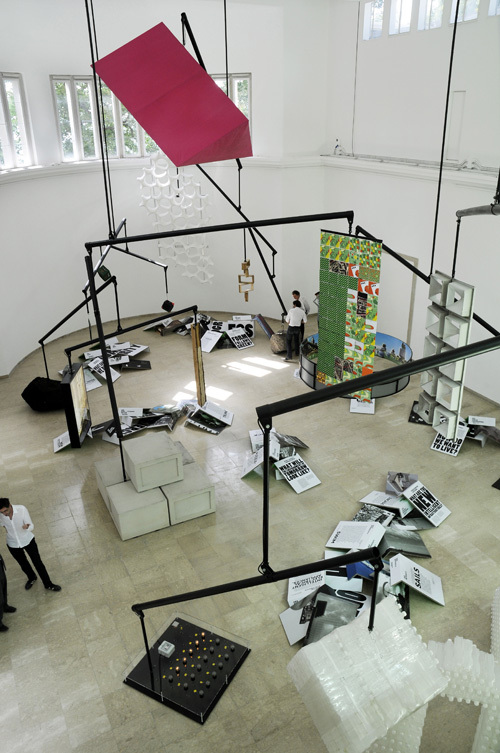 Almost 200 years later, writer Ingo Niermann tries to follow in his footsteps to imagine a new epoch-making artwork. 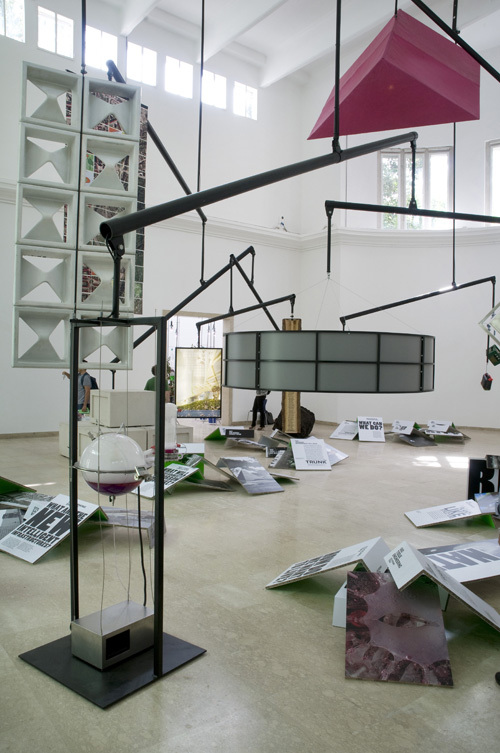 Together with the artist Erik Niedling he starts searching for the future of art and, seeking advice, meets key figures of the art world. 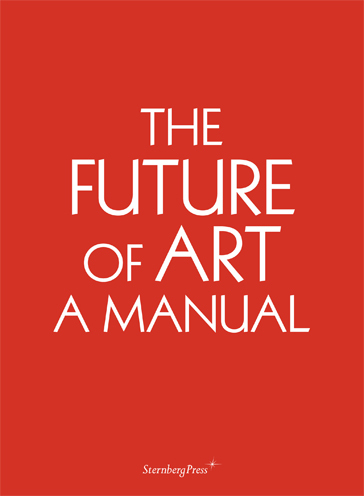 Including the DVD The Future of Art by Erik Niedling and Ingo Niermann (HD, 157 min.). 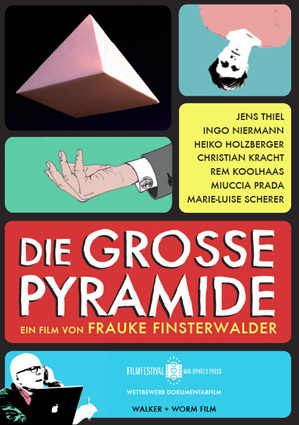 Der Film “Die Grosse Pyramide” ist eingeladen zum Max-Ophüls-Preis und feiert dort im Januar seine Premiere. Ever since the Great Pyramid project gained international media attention people have accused me of having stolen their idea. Usually I had never heard of them before and their ideas were drastically different. But now there is a new situation. Founding member and former chairman Jens Thiel is presenting himself as the legitimate heir to our association’s work, copying and modifying the content of our website. Already last year, a gloomy Thiel told me in front of some witnesses: “Ingo, you invented it, but I am the Pyramid.” Drunk and wearing a hood, he resembled a doomed character from a German Expressionist movie. The months that followed did indeed turn out to be horrible, as Thiel wanted the rest of our team to suffer from his personal crisis at least as much as he suffered himself. He considered this to be “just fair,” as in 2007 he had done more than anyone else to make the Great Pyramid happen. But when the project funding from the Federal Cultural Foundation of Germany was gone and Thiel’s salary ended, his enthusiasm faded. He created a decent financial mess, left our association, and hijacked the association’s original web address, thegreatpyramid.org. I and the Friends of the Great Pyramid claim no copyright on the idea of the Great Pyramid. If Thiel or anyone else should be successful in making it happen, we would only be happy. But stealing content from our website and telling lies about our association is another matter. 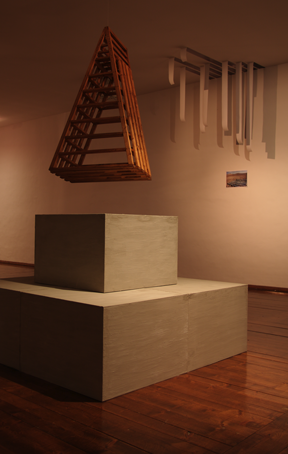 Until now, almost 1600 people have made an unbinding reservation for a Pyramid stone and we have the utmost respect their trust. 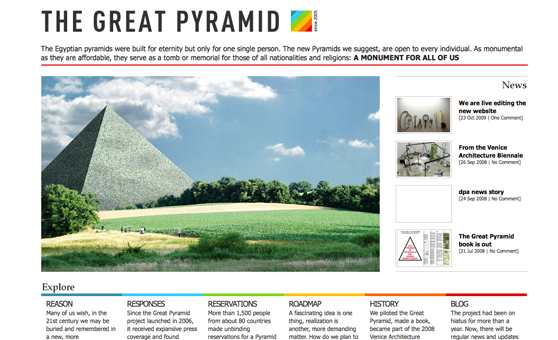 We are currently developing different strategies to make the Great Pyramid actually happen. We are far from defunct. 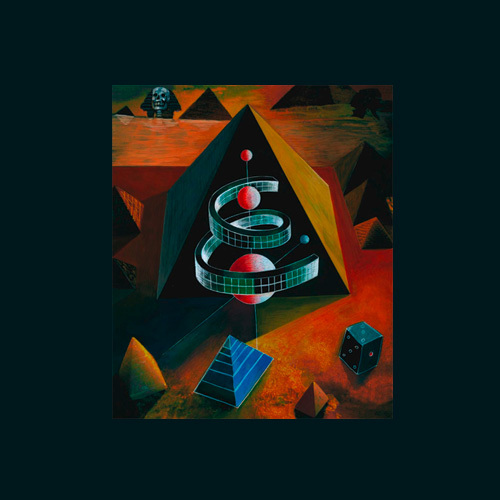 Dial records, a renowned label for electronic music, released the 12” EP ‘Pyramid Drift’ with tracks by Arises, Christoph de Babalon, Momus and Phillip Sollmann (aka EFDEMIN). All music was performed at the Great Pyramid Gala in Berlin last year. After two years, Jens Thiel, founding member and former chairman of the Friends of the Great Pyramid, left our team and our old .org-address is no longer valid! The web address of the Friends of the Great Pyramid is now www.thegreatpyramid.de or www.diegrossepyramide.deThe new elected chairman is founding member and civil engineer Heiko Holzberger. Writer Ingo Niermann continues to be the deputy. Artist Erik Niedling (www.erikniedling.com) joined our team and became the new treasurer. In Bauhaus-City Dessau-Rosslau, Germany, architect Dieter Bankert and politicians from different parties are trying to implement the Great Pyramid. Still, it will be a tremendous effort to actually realize the tomb and monument for all of us. All help is welcome.